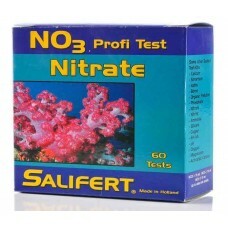 The Salifert Nitrate test kits are the best in the industry! Nitrates are the end product of the Nitrification cycle. While low levels are not toxic, higher levels, depending on it being a reef tank of a freshwater or saltwater fish tank. 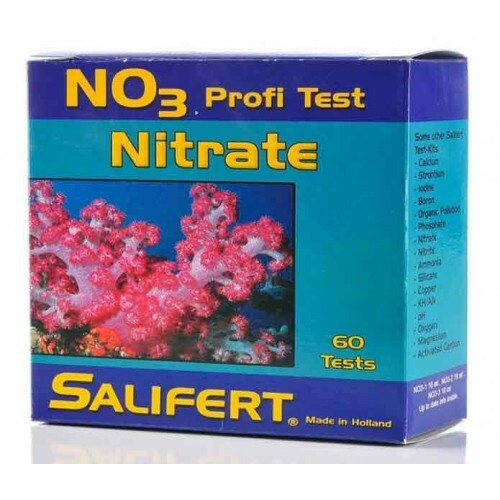 Reef tanks have very small tolerance s for Nitrate (from 0-10mg/l, .05-2 mg/l is optimal) where fish tanks (from 10-100mg/l, where 10-40 mg/l is optimal). The buildup of nitrate can result in unwanted algae growth and the slowing down of coral growth. Place the test vial on the white part of the color chart and compare colors looking from the TOP. Use diffuse daylight when comparing colors.If the color corresponds to a value lower than 10mg/L nitrate then it might be better to compare colors as shown for the low range (see below).